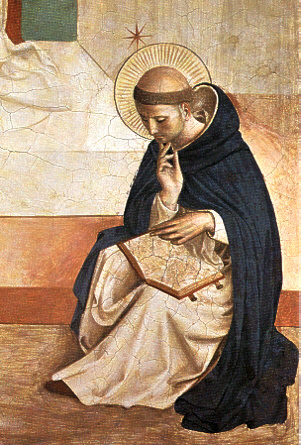 Saint Dominic (Spanish: Santo Domingo), also known as Dominic of Osma and Dominic of Caleruega, often called Dominic de Guzmán and Domingo Félix de Guzmán (1170 – August 6, 1221), was a Spanish priest and founder of the Dominican Order. Dominic was born at Calaruega, Spain, studied at the Univ. at Palencia, was probably ordained there while pursuing his studies and was appointed canon at Osma in 1199. There he became prior superior of the chapter, which was noted for its strict adherence to the rule of St. Benedict. In 1203 he accompanied Bishop Diego de Avezedo of Osma to Languedoc where Dominic preached against the Albigensians (heresy) and helped reform the Cistercians. Dominic founded an institute for women at Prouille in Albigensian territory in 1206 and attached several preaching friars to it. When papal legate Peter of Castelnan was murdered by the Albigensians in 1208, Pope Innocent III launched a crusade against them headed by Count Simon IV of Montfort which was to continue for the next seven years. Dominic followed the army and preached to the heretics but with no great success. In 1214 Simon gave him a castle at Casseneuil and Dominic with six followers founded an order devoted to the conversion of the Albigensians; the order was canonically approved by the bishop of Toulouse the following year. He failed to gain approval for his order of preachers at the fourth General Council of the Lateran in 1215 but received Pope Honorius III’s approval in the following year, and the Order of Preachers (the Dominicans) was founded. Dominic spent the last years of this life organizing the order, traveling all over Italy, Spain and France preaching and attracting new members and establishing new houses. The new order was phenomenally successful in conversion work as it applied Dominic’s concept of harmonizing the intellectual life with popular needs. He convoked the first general council of the order at Bologna in 1220 and died there the following year on August 6, after being forced by illness to return from a preaching tour in Hungary. He was canonized in 1234 and is the patron saint of astronomers. INTROIT Ps 36:30 – 31. EPISTLE 2 Tim. 4:1 – 8. Lesson from the secons letter of St Paul the Apostle to Timotheus. Beloved: I charge you, in the sight of God and Christ Jesus, Who will judge the living and the dead by His coming and by His kingdom, preach the word, be urgent in season, out of season; reprove, entreat, rebuke with all patience and teaching. For there will come a time when they will not endure the sound doctrine; but having itching ears, will heap up to themselves teachers according to their own lusts, and they will turn away their hearing from the truth and turn aside rather to fables. But be watchful in all things, bear with tribulation patiently, work as a preacher of the Gospel, fulfill your ministry. As for me, I am already being poured out in sacrifice, and the time of my deliverance is at hand. I have fought the good fight, I have finished the course, I have kept the faith. For the rest, there is laid up for me a crown of justice, which the Lord, the just Judge, will give to me in that day; yet not to me only, but also to those who love His coming. Grant, we beseech You, almighty God, that we who are heavy laden by the weight of our sins may be sustained by the spiritual help of St. Dominic, Your Confessor. Through Jesus Christ, thy Son our Lord, Who liveth and reigneth with thee, in the unity of the Holy Ghost, ever one God, world without end. R. Amen.